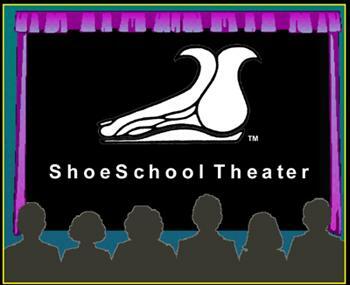 The ShoeSchool Theater Features Streaming Video Clips from our Educational CD Publications, Video Interviews with Students, and other short subject documentaries. Viewing is Free, all you need is Real Player installed on your computer. The Selection of streaming videos will expand continually, check back for an updated schedule of releases. DVD Video - 65 minutes. From selecting the leather to hand lasting the upper, to lacing them up, every process is captured on video, with narration and titles. This Video was created to be Informative, Entertaining, as well as an Educational Experience. It is not an instructional video on how to make shoes. For instructional videos about Shoemaking, visit the Workshops - Distance Learning Project. all the action in less time than it really takes. digital rewind and fast forward. Students Working, Learning, Having Fun! ShoeSchool offers Hands-on Experiential Education Programs for motivated adults. People have come to ShoeSchool from all parts of the US as well as: Italy, France, Bali, Singapore, Brazil, Japan, Canada, St. Kitts. The ShoeSchool Video Scrapbook is a collection of clips from different workshops. See for yourself what happens at ShoeSchool, and hear what students have to say. Meet some of the people that have come to ShoeSchool to participate in hands-on workshops and to pursue their dreams, goals, and passions in footwear. 5 Day Hands-on Workshop where students design and hand craft a pair of leather shoes, start to finish. One-on-one Coaching for those individuals considering a serious investment or career in the footwear business. In depth hands-on training for people with previous experience in footwear. A Comprehensive Video Tutorial of all the Hand Tools used for Shoemaking and Leather Craft. Print the text version directly from the CD ROM. Watch the Video Tutorials on How-to Use and Maintain the Tools of the Trade. For a complete listing of Educational and Instructional Video Publications go to the Distance Learning Project. Streaming Video gives you the ability to play video directly from the Internet, in Real Time, without having to download the file to your computer. Just like watching any other video. This exciting and transformational technology is changing the way we communicate. Real is the leading developer of this technology, and offers the Free Real Player for you to download and install on your computer. The Only Limitation of Streaming Video is Bandwidth. The speed or your modem connection will determine the size, and quality of your Streaming Video Experience. If you are connected on Cable Modem or Satellite, the video should stream perfectly clear and in some cases, depending on your computer system, the video will run full screen. When you see this message box, you need to select the button that is the same as the speed of your modem connection. The video that has been optimized for the particular settings will begin to play at the best size and resolution for that speed.